Force laws that reside in the newly discovered `blind spot' - which are common in nature—can lead to incorrect results. The study also details a new mathematical method to see and avoid this blind spot, safeguarding atomic force measurements from inaccurate results. Professor John Sader, from the University of Melbourne's School of Mathematics and Statistics and the Australian Research Council Centre of Excellence in Exciton Science, led the research, with University of Melbourne researcher Barry Hughes and Ferdinand Huber and Franz Giessibl from the University of Regensburg in Germany. The work is published today in the journal Nature Nanotechnology. "The atomic force microscope (AFM) provides exquisite resolution at the atomic and molecular scale. It also has the remarkable ability to measure the force between two atoms," Professor Sader said. AFM uses a small cantilever beam (whose length is the width of a human hair) to feel the shape of a surface and sense the forces it encounters—in much the same way that the stylus or needle of a record player operates, with a sharp tip at the cantilever's end interacting with the surface. To enable precise measurements at the atomic scale, the cantilever (and its tip) is oscillated 'dynamically' up and down at its natural resonant frequency—slightly away from the surface. The actual force experienced by the tip is recovered from this measured frequency. The researchers can now show that this dynamic measurement blurs the atomic scale force, removing information that can make recovery of the actual force problematic—creating an effective 'blind spot'. "The recovered force may look nothing like the true force," Professor Sader said. "It is remarkable that this issue is completely absent for some atomic force laws, while for others it creates a real problem. "Dynamic force measurements effectively look at the atomic force through a blurred lens. A mathematical algorithm is then needed to convert this to an actual force." 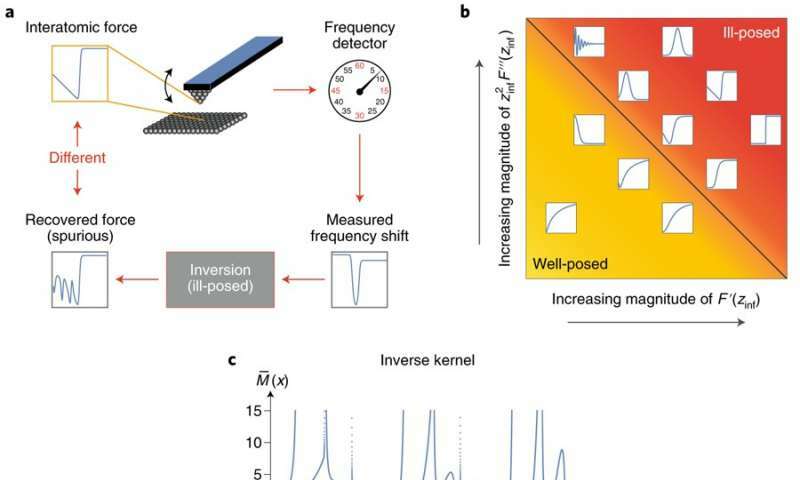 In 2003, Professor Sader and a colleague from Trinity College Dublin developed one of these algorithms—called the Sader-Jarvis method—that is used widely to recover the atomic scale force from this blurred frequency measurement. "There had been no hint that this blurring could be an issue since the dynamic AFM technique was invented in 1992. Many independent researchers have explored it and shown that all standard force laws give highly robust results," Professor Sader said. "Then, last year, collaborators and co-authors of this study from the University of Regensburg saw an anomaly for the first time in their measurements and conveyed it to me. I was surprised to see this anomaly and keen to identify the cause." "The issue is mathematically subtle," Professor Sader said. "Force laws that belong to something called Laplace space—which everyone has tested—are fine. It's the ones that aren't part of this space that cause the problem—and there are many of those in nature." "I like to think of our discovery as giving practitioners the ability to see a 'pot hole' in the road ahead, and thus avoid it with no damage. Previously, this pot hole had gone unnoticed and drivers were sometimes steering straight into it," Professor Sader said. "The next step is to try and understand how to remove this 'blind spot' and 'pot hole' entirely. "Our work also highlights the importance of mathematicians and experimentalists working together to solve an important technological problem. Without both skills sets, this problem would not have been identified and solved. It had gone unnoticed for more than 25 years."